Many images come to our mind when we think of Benidorm: blue sea, sandy beaches, the island on the horizon, amusement parks and a long etcetera. But, no doubt, what it is not obvious in any of these images is the incredible skyline. The history of Benidorm, as we know the city now, begins in the mid-50’s. During the first years of urban development, the buildings were simple low-rise constructions. The real revolution of large-scale blocks began in the early 1970s. Since then many architects have competed making large-scale buildings and creating all kind of designs and aesthetic. Skyscrapers are defined as inhabited relatively tall buildings. We say relatively since it has not come to realize which is the necessary height to be considered skyscraper. It is usually considered skyscrapers those that are more than 80-150 metres. … Benidorm has the most high-rise buildings per capita in the world? In the world! … Benidorm is the second city in the world with more skyscrapers per square metre? It is only surpassed by New York! 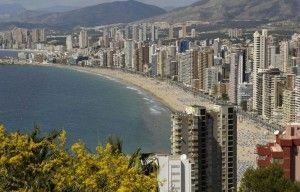 … Benidorm is the second Spanish city with more constructions of more than 150 meter? Madrid is the first and, incredible as it may seem, Benidorm has more skyscrapers than cities like Barcelona. … Benidorm is the third European city with the highest concentration of tall buildings? The cities that surpass Benidorm are London and Milan. … the city was built in such a way that between the different farms there are wide avenues and spaces to avoid any feeling of overwhelm? Everything is thought! … the vertical development of the city is much more sustainable than the horizontal housing? Even it uses less amount of space, waste collection and use of renewable energy are much simpler and more efficient. Benidorm is recognized by many experts as one of the most sustainable urban models on the Spanish coast. Benidorm is popularly known as Beniyork and Little Manhattan. It is not surprising because Benidorm has a total of 310 buildings over 35 m and 26 which exceed 80 m.
It is the tallest building in Benidorm, in the Valencian Community and it is in the top 5 of Spain. It is expected to be the Europe’s tallest residential building (192m), as it is not inhabited yet. It has two towers joined by a kind of diamond that are also houses, all in a golden tone. It is a symbol of Benidorm, especially of Poniente Beach skyline. Until 2014 it was the highest construction in Benidorm (until Intempo was built) and between 2002 (when the hotel opened) and 2007 was the tallest building in Spain. It is accessible by panoramic lifts to its roof, 186 meters high, to enjoy magnificent views of the region and when the day is clear, it is possible to see the island of Tabarca. You can imagine how high it is that it congregates for some years the Base Jump Extreme World Championship! Located on Rincon de Loix and Levante beach, this building measures 158 meters and it has 43 floors. It has been, for many years, the highest residential block in Spain. The architecture of Benidorm cannot leave anyone indifferent. We recommend climb to La Cruz (the Cross) and/or Tossal de la Cala viewpoint. They are perfect places to contemplate the magnitude of the city and to take the best photos. * Remember that we print for free your photo at the campsite reception if you put the hashtag #campingarmanello on Instagram or Twitter. And you, do you remember what did you feel the first time you saw the Benidorm skyline?